The Corner of the master is necessary not only to the house joiner, it is equally necessary for any umeltsa. Well and a workplace of the joiner long since it is considered a workbench. The present joiner's workbench behind which cabinetmakers at factories and in workshops, - a construction bulky work, heavy. In such workbench verstachnaja kleenaja the board to 100 mm is based in the thickness on strong connected by thorns and wedges the supports made from thick bruskov and boards. It will not stir from strong blow, two men hardly move it on a floor, it is difficult to it to find a place in a small premise. Besides it in a protogenic kind simply is not necessary. All three-four its mechanisms replace one joiner's vice. .
For many works it is enough to have verstachnuju a board (fig. 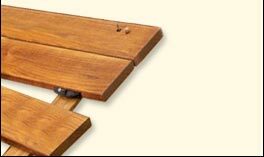 3), which as required krepjat strubtsinkami to a table or a window sill if the width of the last allows. If there is a free and convenient place verstachnuju the board can be strengthened on arms to a wall. For verstachnoj boards well dried up and exactly planed board in length to 1200 mm and 150-200 mm is suitable width, a thickness than 40 mm are desirable big, not less. On a board settle down, as is shown in drawing, adaptations for fastening and deduction of preparations and the details which are subject to joiner's processing. .
Klinoobraznyj to 12 mm will well keep in the thickness cut in a short plate or a piece of plywood brusok, a narrow board, a lath or rejku at planing. This emphasis should be beaten to verstachnoj to a board two-three small nails, but to screw screws the in length of 25-30 mm is better. Hats of nails and screws necessarily drown in a tree on 1,5-2 mm if it is necessary to plane the preparation equal on a thickness to height of an emphasis. Otherwise it is possible to spoil an edge rubanochnoj pieces of iron. To keep preparation during cross-section pilenija, there is enough on the right end of a board level with a back edge and zapodlitso with an end face to strengthen brusochek in the length to 100 mm, section 50X30 mm. During time pilenija preparation press to an emphasis the left hand. It is even better to lay developing emphasis, as is shown in drawing. .
For raskroja wood lengthways on verstachnoj to a board cut in width to 60 mm and depth of 100 mm becomes. In this nest preparation is established vertically and becomes stronger one or two wooden wedges. At zabivke two wedges a hammer it is necessary to strike on top, and bottom to hold with the left hand. But all the same it is better to get to constants of workers a place, and the workbench should decorate it. To decorate, for it not a hammer and not a plane which upon termination of work can be cleaned in a table box, in a case or in other place. Even verstachnaja the board strengthened on a wall near a window sill, always will be in the public eye, and it already conditions, as well as furniture. The workbench should not be allocated among other furniture and the room equipment as on a design (if not to use a word "С‘=С€С‹С–"), and on a way of furnish, colour. The Organization of a corner of the house master - business uneasy. And not only because the workbench if for it there was a place, should be in harmony with everything that is nearby. The workplace should be convenient. .
Not indifferently, as the desktop or a workbench will be shined. Not all the same, what tool to arrange at the left, and what on the right. For example, a hammer, a screw-driver, nozhovkoj, a pencil, shilom work as usually right hand - they and should lie on the right. But if were necessary a square, brusok, screws, a drill, a chisel they are more convenient for having on the left side. If the sheet of paper the pencil is required also was required. To a chisel the commonwealth with a hammer is peculiar, to a drill - with drills, to glue - with a brush, etc. If the place for an oil paint nearby there should be a place to a bottle with drying oil, a thinner is defined. .
the Workbench . Here one of variants of the organisation of a workplace. The small workbench (fig. 4) occupies the space only 0,44 m 2 , including an open part of a floor before a radiator. Length of a desktop of 2100 mm, width verstachnoj boards of 210 mm, a thickness of 40 mm. The width of a table in the left part where the tool locker is arranged, makes 480 mm, depth of 380 mm. The workbench is established on kitchen by the area of 6,3 m 2 . Its design and ways of furnish are predetermined by a lay-out of apartments in serial panel 9-12-СЌС‚Р°Р¶РЅС‹С… apartment houses of series Рџ-49, and also a tonality and furniture of kitchen furniture and the equipment. Authors of the project of an apartment house have preferred in this case in colouring of walls, a floor, the sink, the built in case warm colours, under a light oak, but with bright red-brown details: handles dverok, a fringing. And the new settler, as though continuing a plan of the architect, has arranged kitchen with furniture in which furnish oil colouring of colour bezh is applied. Dverki and boxes of a kitchen table Are pasted over by oak plywood, have bright colour handles and a red-brown fringing. In such tonality the kitchen shelf, a dining table, stools, a loud-speaker, etc. The Industrial aesthetics (and household!) just also recommends to arrange workplaces and dwellings so that anything did not tyre with the forms and colour, did not rush annoyingly to eyes, did not shout, as artists speak. .
From the same reasons of an edge verstachnoj a board and racks are pasted over by decorative plywood of mahogany, are covered by a varnish. Dverka a tool case it is made in tone dverki a kitchen table. JAshchichki a hinged locker are finished by a nut with the elementary incrustation. All handles wooden, executed from sets of decorative plywood. Extreme right and average racks from boards of 30 mm are painted in the thickness by an oil paint. Both racks are not attached to a floor, they are kept by weight of all workbench. The design rigidly fastens only to the left main wall by means of a metal corner of stoppers in concrete and screws. Between end faces of racks and a floor slices thick, РґРѕ10 mm, felt are laid. It is possible to replace it with rubber. It is made that resonant fluctuations from blows by a hammer were not transferred to a floor surface: a guarantee from complaints of neighbours and living a floor more low. Under a hinged locker the pier is closed by sheet of oak plywood on which pockets-boxes for a paper, pencils, slices nazhdachnoj skins are located. On the same sheet it is possible to arrange the most often required tool: squares, rulers, etc. The Device and furnish of such workbench will occupy a lot of time, but work expenses will pay off conveniences in work not only the joiner, but also the carver, the radio fan, the bookbinder. The workbench area can be used on any other appointment, for example as a subsidiary table for cutting of products on which it is convenient to establish a meat grinder, a bread slicer. Now it is necessary to outline sketches, to define the sizes of a board, racks, lockers, shelves, gradually to select a suitable material.